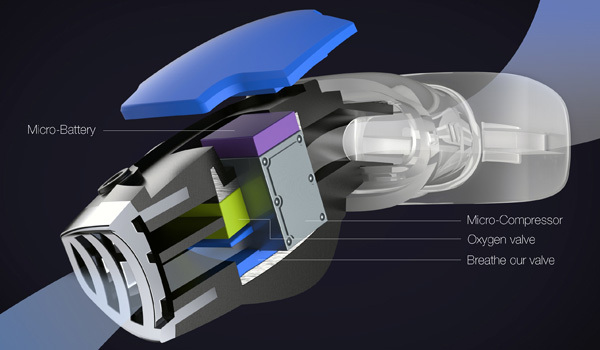 “A new invention looks set to change Scuba and diving in general. It’s shocking task lies in the idea of microscopic, nano scale ‘artificial Gills’, can effectively separate the Oxygen from the water while diving, on demand. A series of tiny threads or strands have microscopic holes along their width, which are smaller than water molecules. It’s called the ‘Triton Oxygen Respirator‘ (Image Below), a miniature but incredible device that will do away for the need to move bulky tanks on dives, and allow the dives to last much, much longer than can be had with current equipment. The weight accumulations will help emergency responders to move around more calmly too without having to movebulky and heavy tanks around with them. We inhale about 6 litres per minute (when resting) and maybe 10 times that when working tough, so a pack containing 2 or 3 litres of water will stockpile a generous supply of O2, enough to last long enough to pursuit and salvage people from smoke filled buildings. The Scuba industry is thinking ahead onto commercial, private and military ships as a secure device expressed to all passengers and crew, aircraft too if they have to dive into the sea. It could also be used on land, by firefighters, with minor adjustments. All they’d need would be a small canister of water or something identical to a hydration backpack to excerpt O2 from..there’s lots of O2 in a particular litre of water..about 630 litres worth.